FC Barcelona's motto is "more than a club", and never has that been more evident than this weekend, as the Nou Camp became a focal point for a city at the heart of the debate over Catalan independence. Barca have always been an inherently political club and, with hundreds injured in clashes as police attempted to stop a referendum declared illegal by the country's constitutional court, they were always going to be at the centre of a story unfolding all around them. 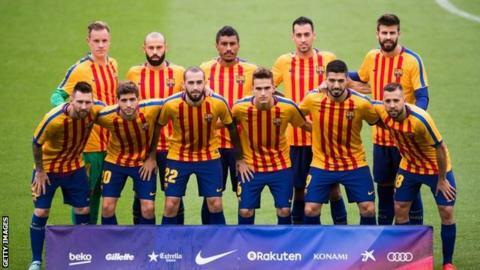 Although Catalonia has enjoyed more autonomy recently than in the days of General Franco's dictatorship, when the Catalan language and cultural traditions were heavily suppressed, the club's role has not changed and Barca are effectively perceived within the region as a national team for a stateless people. So when the Catalan government declared a referendum on independence - ruled illegal by the Spanish government - Barca were inevitably going to play a central role in the drama, especially when La Liga strangely scheduled their home game with Las Palmas on the same day as the vote. The game could just as easily have been set for Saturday, and La Liga's decision to press ahead with the Sunday date backfired with a vengeance when Barca decided at the last minute, amid much confusion, to stage the game behind closed doors and continue an extraordinary day in suitably surreal fashion. What would happen to FC Barcelona in an independent Catalonia? Officially, Barca's stance on the issue of independence has always been one of neutrality, but that did not stop the club from releasing a politically loaded statement a few days before the scheduled referendum. When the central government in Madrid ordered strict measures to prevent the vote from taking place, including the arrest of several high-ranking Catalan officials and the seizure of millions of voting slips from a warehouse, the club responded with force. "FC Barcelona, in remaining faithful to its historic commitment to the defence of the nation, to democracy, to freedom of speech, and to self-determination, condemns any act that may impede the free exercise of these rights," the club said. "Therefore, FC Barcelona publicly expresses its support for all people, entities, and institutions that work to guarantee these rights. FC Barcelona, in holding the utmost respect for its diverse body of members, will continue to support the will of the majority of Catalan people, and will do so in a civil, peaceful and exemplary way." Crucially, it should be noted the club were supporting the process of independence rather than independence itself - arguing the referendum should be allowed to take place in a legal and authorised manner - and stopped short of saying what they wanted the result to be. But the strongly worded statement made it clear Barcelona would not shy away from a hugely controversial political hot potato. And, when the day arrived, they did not back down. As the day of the referendum approached, reports started to circulate that Barca's game against Las Palmas was in danger of being postponed because of security concerns, but local police appeared to dismiss those rumours by insisting they were not concerned about their ability to control the crowds. Nevertheless, those reports intensified again on Sunday morning, shortly after images of police using force to try to block voting started to circulate. There was no official comment from either club or the league itself, but at about 2.45pm local time - 90 minutes before the scheduled kick-off - several credible reports claimed the game had been called off. By then, both sets of players were already in their dressing rooms. The media were being allowed inside the stadium, but spectators were being held outside the locked gates around the perimeter of the Nou Camp, and nobody knew what was going on. A few minutes later, with fans still locked outside amid new claims the game could be played behind closed doors, the players started to emerge for their warm-up, entering the pitch to the surreal sound of scattered applause from stewards and hospitality staff who had been given an unexpected afternoon off. Preparations continued as normal inside the stadium, and it was only at 3.50pm - just 25 minutes before kick-off - that the club announced the game would go ahead but be played behind closed doors, with no spectators admitted. From inside the stadium, the whistles and jeers of fans outside the ground - waiting fruitlessly to be allowed into their seats - were clearly audible, as were the loudspeaker announcements telling fans to leave which followed a few minutes later. Barca president Josep Maria Bartomeu quickly claimed the decision was made as a protest rather than out of security concerns, and the decision may also have been influenced by a prominent supporters' group promising to stop the match with a pitch invasion in the first minute if it went ahead. Is Real fan Tebas right man to run La Liga? Clearly, this issue is not going away, and one man firmly at the centre of the storm is La Liga president Javier Tebas. A lifelong Real Madrid fan who never makes any attempt to hide his allegiance, Tebas predictably has a long-running dispute with Barcelona, who feel it is inappropriate to have the league run by a man happy to flout his personal preferences so openly. A year ago, the club publicly called for disciplinary proceedings to be opened against Tebas after he criticised Barca players for their part in an hot-tempered game at Valencia which ended with Luis Suarez, Lionel Messi and others being hit by missiles thrown by the home fans. Although Tebas perhaps attempted to mend some bridges more recently by questioning the financial structure of Paris St-Germain and Manchester City following their summer exploits in the transfer market, the rift between him and Barcelona is now deeper than ever. Never one to shy away from expressing his opinion, Tebas made a bold move in the run-up to Sunday's referendum by changing his Twitter profile picture to an image of a Spanish flag and a Catalan flag combined into a heart shape. And on Sunday lunchtime, when Barca requested the postponement of their game with Las Palmas in the light of the violent incidents taking place around the region, Tebas was the man who said no, threatening Barca with a six-point penalty if they did not play. Tebas also gave permission for Las Palmas to play with a badge of the Spanish flag woven into their shirts, a controversial and inflammatory move taken by the Canary Islanders to support the "unity of Spain" as they visited a region where many people are determined to leave that country. With his actions over the past few days, Tebas has not exactly looked like he possesses the objectivity necessary to run La Liga with the support of all its member clubs, and we have not heard the end of the row between him and Barcelona. As ever, another figure in the limelight is Barcelona defender Gerard Pique, who has consistently stated his strong support for the campaign to hold a referendum over Catalan independence (although it should be noted he has argued for the staging of a referendum, without indicating how he would actually vote). On Thursday, Pique again asserted his backing for the process by tweeting, in Catalan, that people should express themselves peacefully and sing loud and strong, using the popular hashtag #Votarem, meaning 'We will vote'. Because of such views, Pique has been loudly jeered by Spain fans during appearances for the national team over the past couple of seasons, and Real Madrid skipper Sergio Ramos - Pique's central defensive team-mate in international colours - reacted to his latest tweet by saying it was "not the best thing to do". Undeterred, on Sunday morning Pique was back on social media, posting a picture of him casting his vote in the referendum which has been declared illegal by the government of the country whose football team he represents, along with the caption: "I have voted. Together we are unstoppable in our defence of democracy." After Sunday's behind-closed-doors victory over Las Palmas, which precedes World Cup qualifiers against Albania and Israel, Pique made a long and emotional appearance in the mixed zone in front of reporters. Fighting back tears, he offered to quit the national team before the World Cup finals if his presence was causing a problem, and said "I am and I feel Catalan", but also added "people can vote yes, no or abstain. We just want to vote". The campaign for Catalan independence is not going away, and Pique is fast becoming its figurehead. Read more on Where would FC Barcelona be in an independent Catalonia?